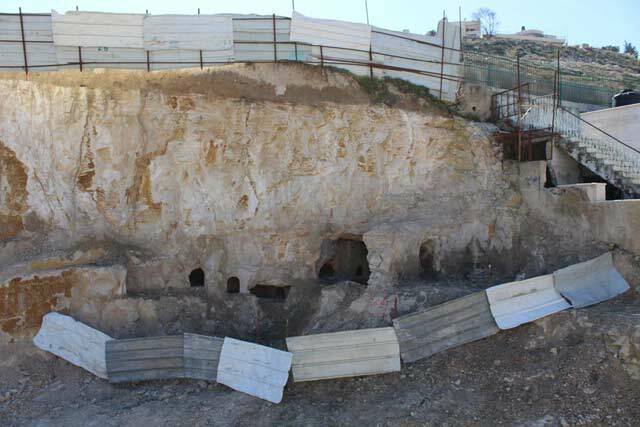 In February–March 2017, two rock-hewn burial caves were documented at two sites in the Jebel Mukabbir neighborhood of Jerusalem (License No. S-746/2017; map ref. 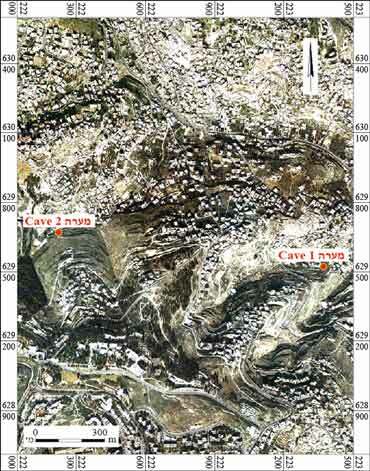 of Cave 1: 223300–28/629459–71, map ref. of Cave 2: 222172–84/629618–32; Fig. 1). The documentation, undertaken on behalf of the Israel Antiquities Authority and financed by M. Raida, was conducted by A. Wiegmann and A. Rose, with the assistance of B. Touri (antiquities inspection). 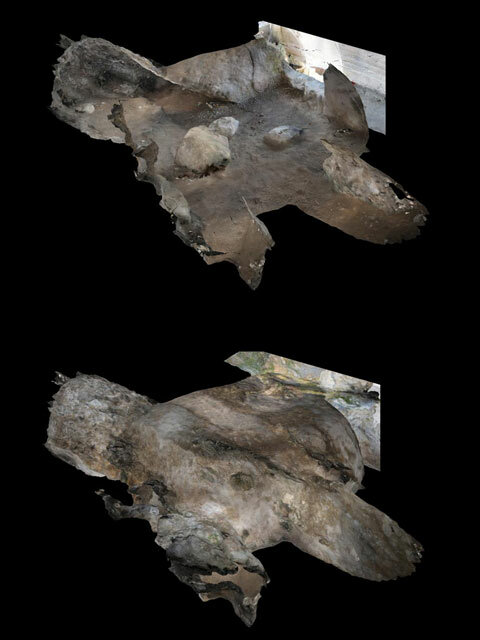 Both caves were documented by means of photogrammetry (a three-dimensional reconstruction based on digital photographs) after their façades were destroyed during development work; they were not excavated due to pressure from ultra-Orthodox circles. The caves were found plundered, and their floor was covered with alluvium. The two caves are located within an extensive necropolis of the Second Temple period, which stretched along the banks of Nahal Azal (Kloner and Zissu 2003:192–202). Cave 1 was partially documented in the past (Brandenburg 1926:123–125). Cave 1 (Figs. 2–7). The cave was carefully hewn in soft limestone bedrock on the southern bank of Nahal Azal. Its eastern part was entirely destroyed during extensive earthworks that cut a vertical section through the slope (Fig. 2). The entrance to the cave was probably via the northern area (L100; 2.3 × 4.1 m, max. preserved height 1.5 m)—an open courtyard or a room whose ceiling was destroyed. An opening (0.85 × 1.01 m, depth 0.95 m; Fig. 6), set in a recessed frame, was hewn in the southern wall of Area 100. 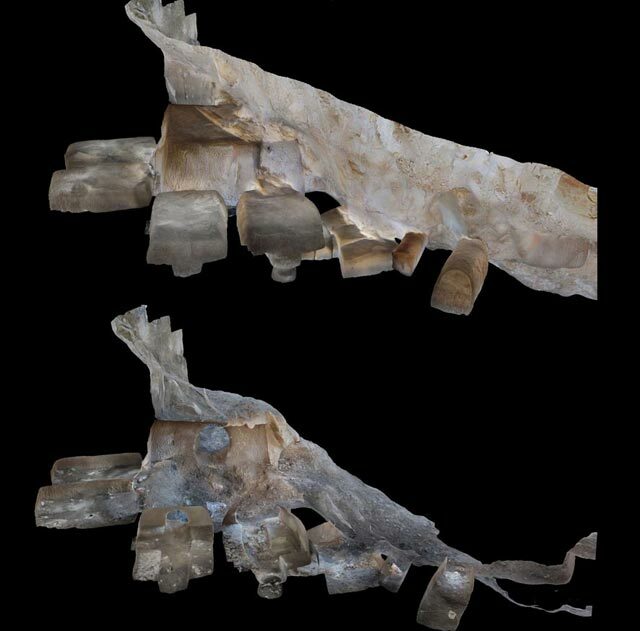 The inner part of the opening was rounded and widened, probably the result of later hewing, and it led into a square burial chamber (L101; 2.95 × 3.35 m, preserved height from the top of the standing pit 1.75 m). The corner of the standing pit was exposed in the southwestern corner of the burial chamber. Openings in the western and southern walls of Room 101 led to small, hewn rooms of similar dimensions, with two benches along their long walls (L102–L105; 1.5–1.7 × 2.2–2.3 m, ceiling height above the benches 0.45–0.55 m). Room 104 had an arched opening set in a carved frame (0.40 × 0.45 m); it seems that the openings leading into the other rooms were similarly carved, but were later enlarged to a width of 0.9–1.0 m. A small niche (L106; width 0.35 m), probably a bone repository, was hewn in Room 104. A round pit that served as a bone repository (L107; diam. 0.45 m, depth 0.35 m) was hewn at the bottom of the standing pit in Room 105; The other rooms probably had similar pits, but these could not be identified due to the alluvium covering them. A curved passage (length 1.2 m, width 0.52 m) was hewn through the bench in the eastern part of Room 105. It led to another chamber (L108; 1.40 × 2.05 m), which was equipped with low, meticulously hewn arcosolia (0.65–0.75 × 1.4 m; max. height 0.55 m) arranged along its northern and southern walls. The southeastern corner of Room 108 severed a small, hewn loculus (L109; 0.40 × 1.05 m; height 0.6 m). As its orientation differed from that of the rooms in the cave, it may belong, together with another loculus to its southeast (L110; 0.8 × 2.1 m; height 0.8 m), to an additional, destroyed cave. East of Loculus 110 were the remains of what was apparently the corner of a burial chamber whence the loculus was hewn (L111; Fig. 7). 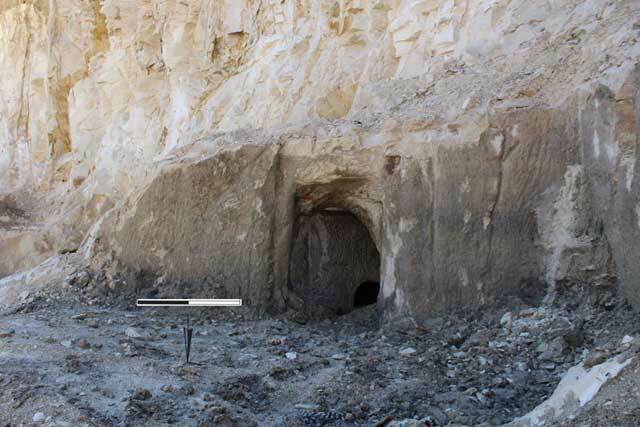 The niche (L106), the bone repository (L107) and the arcosolia (L108; Kloner and Zissu 2003:30–31, 36–42), all suggest that this cave was used in the late Second Temple period. The cave was partially documented in the 1920s by Brandenburg, who published a plan and a description of Rooms 100–108 and of two additional rooms, similar to Rooms 102–103, which were hewn along the eastern wall of Room 101 but were destroyed prior to the present documentation. In his description of the passage between Rooms 105 and 108, Brandenburg pointed out a stone slab that covered the upper part of the passage, but the slab was not found in the current examination of the passage. Brandenburg stated that the openings of Rooms 102–105 were c. 0.5 m wide, suggesting that they were enlarged after he carried out his documentation. Brandenburg did not describe the arcosolia in Room 108 or Loculi 109 and 110, which were evidently covered with alluvium when he visited the cave (Brandenburg 1926:123–125, Fig. 34). Cave 2 (Figs. 8, 9). The cave is located on the northern bank of Nahal Azal. Its northern part was destroyed during development work, and a concrete wall was constructed in its opening. The cave has numerous karstic fissures, which were enlarged when it was quarried. A square opening (width 1.15 m) led into a square cavity (L200; 2.65 × 2.80 m; max. height above the alluvium 1.2 m). The northern part of the room’s western wall was hewn in bedrock, but no other rock-cuttings were discerned on the other walls of the chamber. 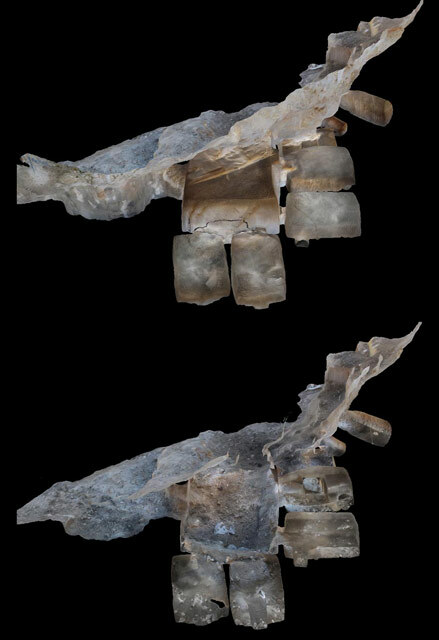 An irregularly shaped loculus (L201; 0.6 × 1.5 m, height 0.85 m) carved along a karstic crack was set in the eastern wall. 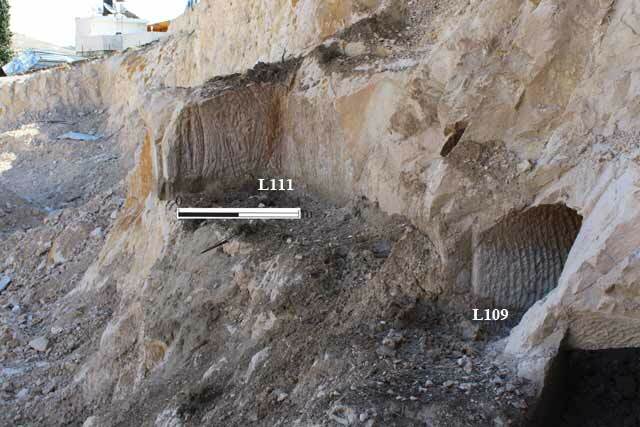 To the west of Room 200 was an irregular cavity, in which no signs of rock-cutting were discerned (L202; 2.1 × 2.3 m; max. height above the alluvium 1.1 m). The cave cannot be dated on the basis of its plan. It may be a Second Temple-period loculus cave that was roughly hewn, but it is possible that Loculus 201 is not a burial niche, but rather an attempt at widening a karstic fissure in order to create a new room or to enlarge Room 200 to the east. Brandenburg E. 1926. Die Felsarchitektur bei Jerusalem. Kirchhain. 2. Cave 1, looking west. 3. 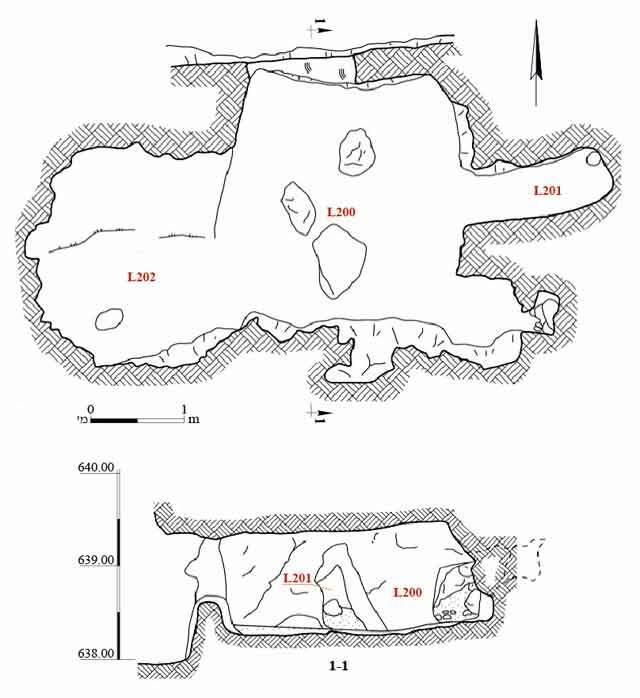 Cave 1, plan and sections. 4. The photogrammetric model, looking north. 5. The photogrammetric model, looking east. 6. The passage between Rooms 100 and 101, looking south. 7. Remains of Room 111, looking southeast. 8. 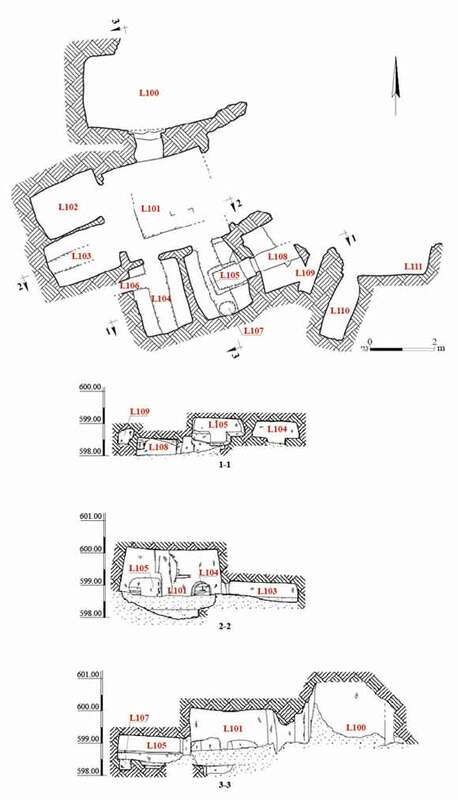 Cave 2, plan and section. 9. The photogrammetric model, looking northwest.